The website Sci-Hub provides access to scholarly literature via fulltext PDF downloads. The site enables users to access articles that would otherwise be paywalled. In March 2017, Sci-Hub tweeted the identifiers (DOIs) for all articles in their repository. By integrating this dataset with a catalog of scholarly literature, we assessed Sci-Hub's coverage and found that Sci-Hub contained 86% of articles in toll access journals. This number rose to 96% for recently-cited articles. In fact, Sci-Hub contained more toll access articles than were electronically available from University of Pennsylvania's libraries, despite Penn's annual subscription expenditures of $13 million US. Legal suits by publishers have been unable to curb Sci-Hub's adoption. 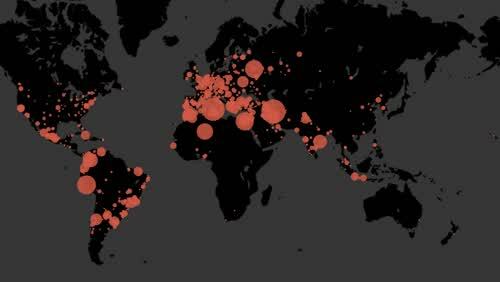 We suggest the ubiquity of Sci-Hub will disrupt scholarly publishing. Specifically, toll access publishing will no longer be a viable business model. We provide evidence that the transition is already underway and urge the community to adopt libre open access as an alternative. This study was performed openly on GitHub at https://github.com/greenelab/scihub and is published at https://doi.org/ckcj. Daniel Himmelstein is a postdoctoral fellow in the Greene Lab at the University of Pennsylvania. His research integrates public data to help understand human disease. Daniel is also a proponent for open science and has done several projects to improve openness and communication in science. These projects include investigating publishing delays at journals, legal issues regarding data reuse, the license choices of preprint authors, and most recently the coverage of Sci-Hub. Previously, Daniel received his PhD in Biological & Medical Informatics from the University of California, San Francisco. This is Daniel's first time to Switzerland. 2013-03-20: Sci-Hub switches to using LibGen as a repository to cache articles. Ⓑ 2015-01-04: LibGen domain name registrations expire after site administrator dies from cancer. Ⓒ 2015-06-03: Elsevier files a civil suit against Sci-Hub and LibGen in the U.S. District Court for Southern NY. Ⓗ 2016-04-29: Elsevier wins a default judgement ordering defendants to pay Elsevier $15 million. Ⓘ 2016-06-23: The American Chemical Society files suit against Sci-Hub in the Eastern District of Virginia..
From the Washington Times Legal Classifieds on 2017-07-27. ACS paid $305.55. Ⓚ 2017-09-05: Sci-Hub blocks access to Russian IP addresses due to disputes with the scientific establishment. Ordered that any person or entity in active concert or participation with Defendant Sci-Hub and with notice of the injunction, including any Internet search engines, web hosting and Internet service providers, domain name registrars, and domain name registries, cease facilitating access to any or all domain names and websites through which Sci-Hub engages in unlawful access to, use, reproduction, and distribution of ACS’s trademarks or copyrighted works. Computer and Communications Industry Association (CCIA) filed an amicus brief (rejected) regarding the suits targeting of "Neutral Service Providers"
ACS Mission: To advance the broader chemistry enterprise and its practitioners for the benefit of Earth and its people. Ⓛ December 2017: Search interest spikes as domains are suspended after ACS judgement. But what scholarly articles are not in Sci-Hub? Tools such as oaDOI are limited due to low prevalence of Green OA articles. While this study had a number of interesting aspects, its virtual lack of success as a tool for reducing the library's journal budget was largely due to the fact that the overall problem was seen by everyone concerned as a library problem. As such, the only solution available to the library in 1981 was to use monograph and binding funds to help offset the shortfall in the serials and journals budget. While the biology and chemistry libraries were spared drastic cuts because of very generous support from divisional funds, Caltech's engineering libraries were extremely hard hit, and only now after nearly seven years have they recovered (just in time for the current crisis). It should be pointed out here that from 1974 to 1983 the materials budgets for the departmental libraries were the responsibility of appropriate divisions. Dana Roth (1990) "The Serials Crisis Revisited"
Sci-Hub ⇒ open scholarly literature? Librarians will never drop subscription access & recommend illicit alternatives … ? What library will continue to subscribe if a growing proportion of articles is available for free elsewhere? Defendants’ actions also threaten imminent irreparable harm to Elsevier because it appears that the Library Genesis Project repository may be approaching (or will eventually approach) a level of “completeness” where it can serve as a functionally equivalent, although patently illegal, replacement for ScienceDirect. where it was used to compose a highly-collaborative review article [@doi:10.1101/142760].